Internationally, Herta Müller is best known as a novelist, but since winning the 2009 Nobel Prize in Literature, Müller has not published a single novel or collection of short stories. Her publications since 2009 consist of essays, interviews and — poetry. Indeed, this is the first time since her earliest days as a writer that Müller does not use narrative prose as her main mode of writing. In the 1980s, Müller abandoned her youthful poetry in favor of writing short narrative prose — and eventually, novels. It is as a novelist that she became famous and critically acclaimed. Yet her beginnings as a poet — much like Thomas Bernhard’s — have shaped not just her early prose, but much of her subsequent writing. Regrettably, as with Bernhard’s poetry, her first translated poetry for an American audience is marred by a translation that does not rise to the challenge and promise of the text. A warm and vibrant poetry is turned into small, dour, humorless lumps, like a game of Chinese whispers among IRS employees. This is particularly regrettable because it is hard to overestimate the importance of poetry to the oeuvre of Herta Müller. 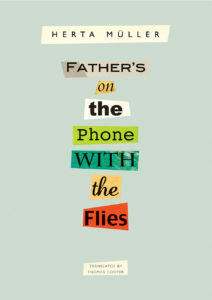 In fact, her most recent collection of poetry, Vater Telefoniert Mit Den Fliegen, a selection from which was translated by Thomas Cooper as Father’s on the Phone with the Flies and published this year by Seagull Books, should be seen as a culmination of her poetry, much as Atemschaukel, her 2009 novel, can be said to be a culmination of her prose. Atemschaukel condenses themes of home and migrancy, of alienation and dictatorships, into an affecting narrative that cautiously leaves behind the autobiographically inspired terrain of her previous novels. Atemschaukel is not about Herta Müller — it is about Oskar Pastior, her friend and fellow poet. It is also the only novel published in the 2000s — a period which has seen her publish three German-language collections of poetry (and one Romanian collection). 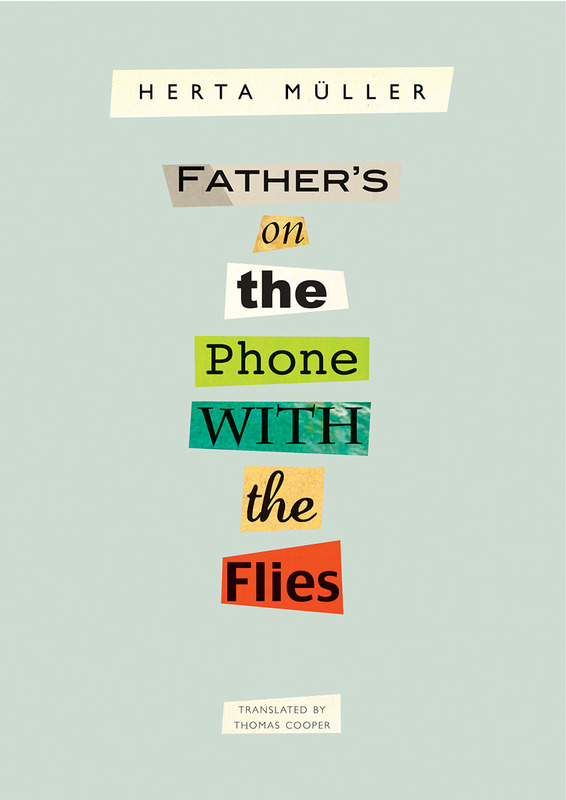 There is a sense of Müller, at least temporarily, turning back to poetry — and Father’s on the Phone with the Flies is a crowning achievement of her poetry. It completes a literary trajectory that began when Müller was a teenager, writing poetry in Romania. Müller is often read as a political writer — but the impetus in her work has always been personal. In the 1980s, Walter Fromm developed the term “engaged subjectivity” for the poetry written by Herta Müller, Werner Söllner, Richard Wagner, and other important German-language poets from the Banat region in Romania. The term was supposed to mark a difference to the more directly personal poetry written in the West, because despite the personal narratives of these poems, political events provided a constant background to this poetry written under the constant threat of political censure. Müller’s eventual shift to prose, leading up to her first collection of prose in 1982, was done for personal reasons as well: she set out to examine the villages in the Banat where she grew up, writing about village life with a critical eye, using language as a means of interrogating ideology and thinking as she hadn’t been able to do in her previous poetry. Müller’s work can be best described as struggling with language and context. She’s interested in the way violence is woven into the contexts of daily life and speech — and her novels often tell of a rupture of sorts. It is no accident that her novel of migration to Germany, Reisende auf einem Bein, is also the first time Müller mentions the collage method that she would perfect in her four major postcard poetry collections from 1992 to 2012. In the novel, the female protagonist uses collages of photographs to re-arrange a sense of reality and coherence. There’s an element of giving up control to the arrangement of cut-up photos — all too fitting for a character who had to give up control in her own life. The distrust and alienation of dictatorships, the violence of village life, the destructiveness of German 20th century history, and finally, migration, forced or voluntary, are all violent events that tear people from their immediate contexts. Müller’s characters have to re-assemble their reality from the bits and pieces of new contexts and new realities, and language is a central element of these efforts. Lyn Marvel has referred to the collage in the 1989 novel as “a cypher for trauma,” and it is easy to see why. While the switch to prose in her 20s was deliberate, and partially based on a rejection of the poetry she had been writing in the 1970s, this switch was not an immediate shift from poetry to novels. In fact, the first piece of prose published, the 1978 “Die Strassenkehrer,” was originally published in a magazine’s poetry section, with line breaks, looking and reading like a poem. In it, Müller makes heavy use of irony, shifts in meaning, repetition, parataxis, parallel structures — all of which recur time and again in her prose, and become a centrally constitutive element of the poetry as well. Müller never completely turned her back on poetry — but it is the 1993 publication of Der Wächter nimmt seinen Kamm that marks a real shift. This is when she started writing the so-called postcard poetry. It is generally called that because it consists of collages (texts and images) on the back of a postcard. While the most recent three books are bound as books, the 1993 Wächter was just a loose collection of cards in a box, like B.S. Johnson’s The Unfortunates. Unnumbered and without titles, these poems invited you to create your own narrative and structure. In addition, much as “Die Strassenkehrer” was a transitional text between poetry and short prose, Wächter is a transitional text between these same genres, but in the other direction. There are no obvious indentations, there’s no rhyme or obvious rhythm to these texts which could also be seen as prose. What gives them away as poems isn’t the fact that they are flush left — it is Müller’s incredible attention to the line as a unit in the text. These poems are, in the most explicit sense of the word, hand-made, fixed on the page, carefully aligned. In interviews, Müller has stressed the way she and the words on the desk before her collaborate in creating these individual poems. For example, in a 1998 interview she describes herself as “outside and inside” the creative process at the same time. Wächter is transitional in other ways, as well: the book is much darker than the subsequent collections, much more of a piece with the novels Müller was writing at the same time. There’s a terrifyingly dark poem about friends forced into suicide by the dictatorship and feeling abandoned by God, which could serve as a companion piece to Herztier, her 1994 novel that touches on the death of the same friends. After Wächter it took Müller seven years to return to publishing poetry. The result, Im Haarknoten lebt eine Dame, was the first of three collections she published between 2000 and 2012. These three seem part of the same project — they are more similar to each other than they are to that first collection of postcard poetry — and not merely because they are published as “proper” books. The tone is lighter, and the books themselves literally more colorful: the art and writing used for these collages are brighter — and Father’s on the Phone with the Flies is the brightest and lightest of the three. It’s not that the poems don’t touch on dark topics, but they do so in more playful, lyrically intricate ways. Im Haarknoten lebt eine Dame is flush left, has line indentations, it looks like poetry. Like Wächter, pictures and words are given almost equal space on the page, the result is a true combination of text and image. As with the first collection, there are no page numbers here, something that continues in the 2005 Die Blassen Herren mit den Mokkatassen. That collection, for the first time, contains collages of words from magazines with large fonts and colorful backgrounds. The images, while still prominent, do not get equal billing on each ‘postcard’ — at this point, the book merely contains a white rectangle that suggests a postcard. That design is retained for Father’s on the Phone with the Flies, which finally banishes the images to decorative roles on the postcards. The images are now mostly small. The text itself becomes the image. The colorful, large fonts, the arrangements that are no longer flush left, but start at the left side of the ‘postcard’ and end on the right side, become explicit elements of the text’s design. Indeed, the company that helped Müller design the book is selling reproductions of each collage. It is, this much is clear, a difficult book to translate. It requires care, linguistic nimbleness, and a clever typographical design. None of which is found in Thomas Cooper’s translation. This is not a case of a translation overrun with mistakes, it is small details that are off (Cooper has a fondness of translating “im,” which is a contraction meaning “in dem” with “in” instead of “in the” – so “blood in the snow” turns into “blood in snow,” for example), but they contribute to a general sense of unease with the texts. The German text is often difficult to parse — it works more with rhythm and humor and allusion than with straightforward statements. Cooper has replicated the elusiveness of obvious meaning without including any of the other elements. He has taken a text that is sitting in between poetry and prose, and is specifically designed to sit there — and has turned it into awkward lyric poetry by inserting his own, frequently odd, linebreaks which occasionally isolate one word, or part of one word on a single line, whereas Müller’s lines are teeming with words. One assumes these new line breaks were made with Müller’s assent, but the resulting poems are less complex, less interesting, and less ambiguous than the originals. The design decisions also boggle the mind. To Seagull’s credit, the book is entirely bilingual, reproducing the complete collage of each poem on one side, and the translation on the other, as a small lump squeezed into the left corner of each page. The visual impression of the book perfectly matches the quality of the translation that reads like a quick, last minute interlinear translation, going for the easiest choice rather than the most fitting or the most resonant. There are clear lines in German that are rendered into curious puzzles in English, and not a single humorous moment has survived this rough translation. It bears repeating: this is not a matter of mistakes, although there are a small handful of those, as well. The impression here is one of carelessness, which contrasts with the enormous care and effort that went into Müller’s original compositions. In Müller’s work, emigration is often accompanied by violence, physical, emotional or intellectual. Texts and language reflect this violence. Her collage poetry is a mirror of the de- and re-contextualization of the immigrant, of the writer fleeing a dictatorship and its oppressive brutality. Müller’s work focuses on the ethics of writing — one wishes that the translator and his editors had kept these same ethics in mind as they went about publishing a translation of one of the great poets and novelists in the German language. Instead, they produced something that feels rushed and in no way equal to the complexities of a body of work that deals with the traumas of the 20th century in a unique and powerful way. Marcel Inhoff is a German scholar, poet, blogger and book reviewer.